Many combat casualties are victims of explosives, resulting in catastrophic polytrauma with multiple types of injuries. Terrorists attack in an attempt to drain resources, injuring many, with grueling psychological effects to help get their message across. Blast injuries are not as unique to battle as we would hope, however, as they are unfortunately becoming more common worldwide outside the battlefield environment. Familiarity with imaging manifestations of blast injuries, for example, is paramount no matter the setting, country, or location. Disasters, explosions, and shootings can happen in all types of settings and can occur anywhere. 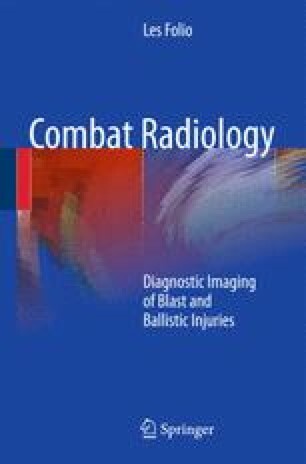 Some example cases of blast and ballistic injury are highlighted to illustrate our experiences in imaging findings and surgical follow-up in combat casualties.